Today is the last day of Tevatron. 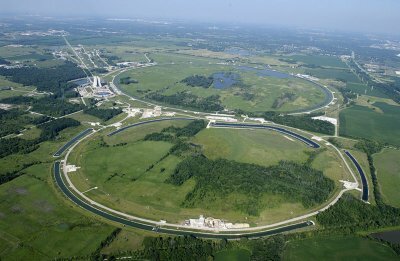 Tevatron is a particle accelerator, and it started the physics measure in 1985, on the night of 13rd october. 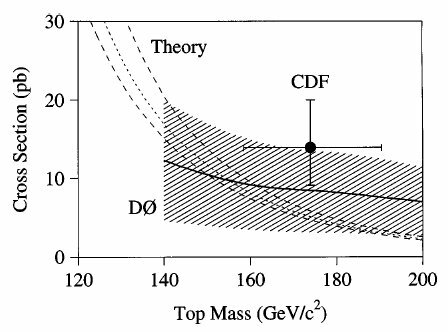 The story of Tevatron is reach of great events, and Tommaso Dorigo write a great summary of Tevatron's physics, in particular the first great physics result: the discover of the top quark! In Standard Model we have 6 quarks, and they are the elementary particles that constitue barionic matter. They was introduced in physics with a parton model indipendetly developed by Murray Gell-Mann(1) and George Zweig(2, 3) in 1964. The original theory is constituted by three partons (up, down, strange), but in the subsequent years were provided also the others three quark. 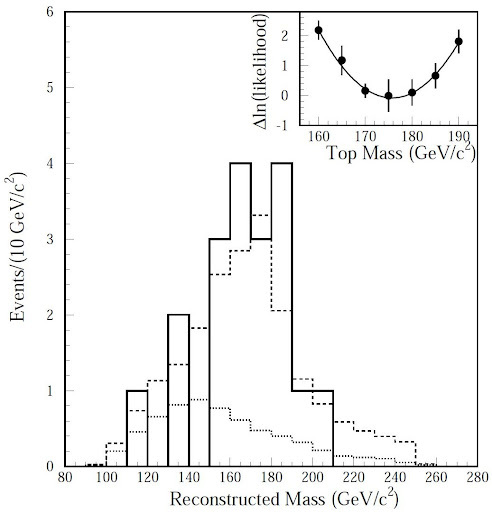 In particular in 1972 Makoto Kobayashi and Toshihide Maskawa(6) proposed the existence of a new quark, the well known top quark: they introduce in weak interaction theory, discovered by Weinberg in 1967(4) and 1971(5), the CP-violation. In particular they write the hadronic parts of the lagrangian in four terms: kinetics, massive, strong and $L'$. Following the Higgs mechanism(9), they supposed that the CP-violation it could be in massive term, because the spontaneous breaking of gauge symmetry. (2) G. Zweig (1964). An SU(3) Model for Strong Interaction Symmetry and its Breaking (pdf). CERN Report No.8182/TH.401. (3) G. Zweig (1964). An SU(3) Model for Strong Interaction Symmetry and its Breaking: II (pdf). CERN Report No.8419/TH.412. (9) I briefly described the Higgs mechanism in A circle around Higgs boson.